*FULLY PAINTED STATUE COMPLETELY FINISHED AND READY FOR YOU TO DISPLAY WITH NO PAINTING, BUILDING OR GLUING REQUIRED! 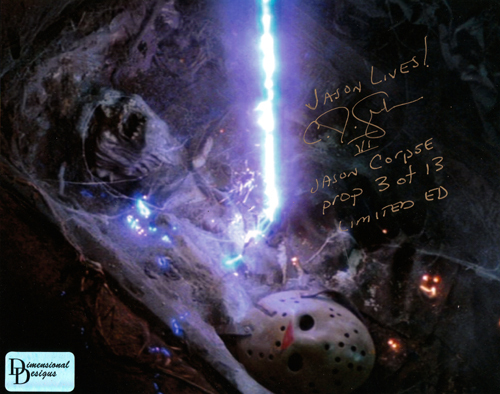 Dimensional Designs Custom Collector's Jason Corpse Prop Ultimate Autographed Limited Edition of 13 Copies. Jason Corpse Prop Ultimate Autographed Edition includes: Life Size 1/1 Replica Signature Series Jason Corpse Prop, Dimensional Designs Authentication Hologram Seal on 8 x 10 Color Photo Certificate Of Authenicity Numbered Limited Edition of 13 pieces Numbered & Signed by C.J. Graham (Jason Lives / Part 6)and Life Size Replica Wearable Hocky Mask. Don't be a unlucky victim and miss out on this item. Only 13 very lucky & wise people in the world can have this once in a life time collectible in their possession. So don't delay if you want this item, because as we get closer to the end of this edition, the price will increase on each of the remaining corpes in the edition. You have been warned!